They happened to a white woman. Deadspin has obtained a lawsuit filed by a former employee of the Atlanta Hawks (don’t ask me how; technically, we’re the same company, but those guys get all the good dirt) alleging that the NBA franchise engaged in a terrible pattern of reverse discrimination by promoting black people, laughing and even stooping so far as to ask her to do better before they fired her. Ignoring and being dismissive of white people, especially white women: Which technically makes me racist, too. But we’re not here to talk about me. Making jokes about white culture: Wait ... you can be sued for that? Making it clear he wanted to hire black people instead of white people: Again, Kline was the community-development coordinator ... in Atlanta. Atlanta! Are there even any white people in Atlanta? I know there’s Falcons quarterback Matt Ryan, the people who write the Real Housewives scripts and “White Kim,” the tenured exotic dancer at Pin-Ups. I think that’s about it. It’s really not a difficult “community” to develop. Expecting more out of white employees than black employees: Which, if true, would be the first time this has ever happened. 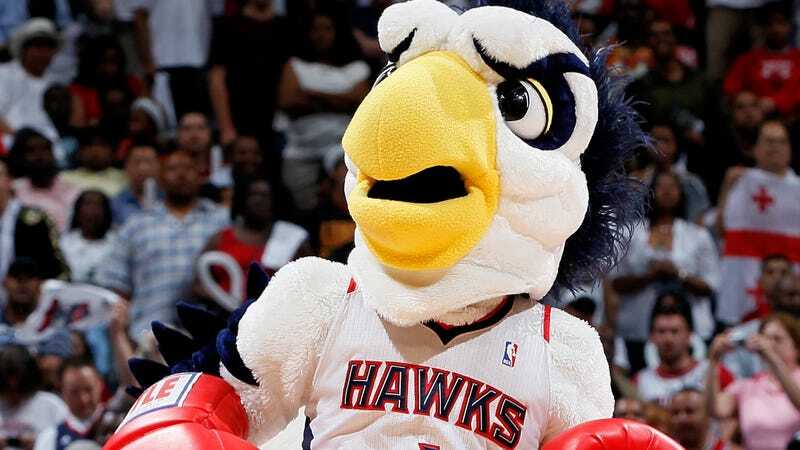 Maybe the Hawks were giving them gradual reparations for slavery. Promoting and hiring less-qualified black employees over white ones, especially white female workers: Typical. When will white women ever catch a break? Giving raises and promotions to black employees: Again ... reparations, maybe? Kline said that when she brought up her oppression, the Hawks retaliated against her by scrutinizing her work, giving others credit for her work and not recognizing her accomplishments. The lawsuit even accuses people at her job of gossiping and making fun of her. Now, qI was with Kline until I read this part. You mean to tell me that—all this time—I should have expected recognition for hard work at my job? That’s gotta be a white thing. And the part about being ignored? This is unheard of (for a white woman)! There’s no way I believe that black people joked and made fun of their co-workers. I’m pretty sure we should be marching for Margo right now. Who’s the Al Sharpton for white women? Someone get Gloria Allred on the phone right now! You know what? I’m kinda confused, too. Then Kline alleges that the Hawks did something very disrespectful—they fired her with no warning! (Actually, Kline admits that there was a meeting between her, the HR officer and Shaw during which they warned her about “deficiencies in her conduct and/or performance,” including a list of things she could approve on). But—aside from that notification that they blithely called a “final warning”—they fired Kline with no warning! OK, maybe you’d point to the numerous occasions where Kline says—in the lawsuit—that her work, performance and demeanor were criticized as technically “warnings,” but why you gotta be so technical? It’s because she is a white woman! I would never say Margo Kline was wrong and that the Hawks were not racist against white people. There’s no evidence of that. He’s a good guy on the cover, but he’s African. He has a little two step in him = says what you like to hear, but behind closed doors he could be killing you. Con isn’t bad, but it’s there. African-like, storefront looks great but there’s a black market section in the back. Then there was the email by former Hawks owner Bruce Levenson that said he wanted more white fans but that hip-hop music and the black cheerleaders were scaring away the white people. While this may sound like a typical day in corporate America for any black person, Margo Kline shouldn’t have to deal with this level of disrespect. As someone who frequents Atlanta at least twice a month, I, for one, am outraged. From now on, I’m going to treat every white woman I see in Atlanta with the respect she deserves! White Kim and Margo Kline, I’m here for you!